Salvage crews are to try to refloat a ferry which has run aground off the Blackpool coast. A total of 19 crew members and four passengers were flown to safety from the Riverdance after it was hit by a freak wave, causing it to list. The truck ferry was travelling from Northern Ireland to Heysham. Owner Seatruck Ferries said a team of salvage experts were on their way from Europe. It is hoped high tides will help refloat the vessel. Although still carrying 100 tonnes of bunker fuel for its main engine and 50 tonnes of gas oil, there are not thought to be any dangers of pollution because Riverdance is reasonably stable. Helicopters from the RAF, Royal Navy and Irish Coastguard battled mountainous seas and 60mph (96km/h) winds to rescue those on board on Thursday night. Fleetwood RNLI crews said it was "some of the worst" weather they had seen. Initially four passengers and 10 of the crew were winched ashore, while the remaining nine crew tried to refloat the roll-on roll-off ferry. But they too had to be pulled to safety. 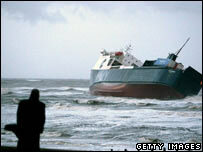 Kevin Hobbs, chief executive of Seatruck Ferries, said: "The vessel is stable and on the beach. "The vessel blacked out, which means all the power faded away. A team of international salvagers are going to come here later today to do a risk assessment. "The crew are absolutely fine. Two were taken to hospital with minor injuries and discharged within two hours at Blackpool hospital." Mr Hobbs said a risk assessment was carried out by the captain before it set sail. It was carrying 50 trucks and trailers from Warrenpoint in Northern Ireland to Heysham, Lancashire, when it ran into difficulty. There were four passengers on board, a married couple and their teenage son, and a lone lorry driver. Mr Hobbs said: "The crew were fantastic, they took control of the situation. "The captain took the initial decision to take the four passengers off and remain on board with only essential crew. They stabilised the vessel. "Unfortunately, as the early hours and beyond went on, the weather continued to deteriorate, and the captain decided to abandon ship." John Matthews, from Fleetwood RNLI, said the conditions were "terrible". "I've got to say that the two lifeboat crews and the helicopters did a wonderful job," he said. "Listening to it on the radio, everything was very calm and professional. I was quite amazed by how calm the master of the ship was. "It was a good outcome, considering the horrendous weather. It could have been a lot worse." It is hoped that high tide, due at 1800 GMT, will help lift the ferry clear of the sand and right it.